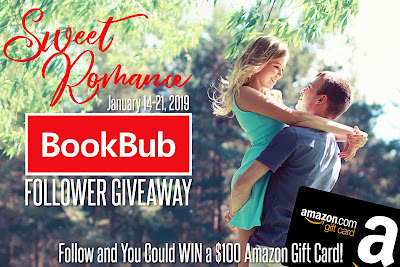 Ten awesome authors, including Sweet Romance Reads authors Jean C. Gordon (me) and Raine English, have come together for the Sweet Romance Bookbub Follower Giveaway. It’s your opportunity to find some new books you might enjoy AND get a chance to win a $100 Amazon Gift Card! All you have to do is click the giveaway picture, visit my, Raine's, and the other participating authors' Bookbub profiles, and follow us. The more authors you follow, the more chances you have to WIN. It’s that easy! The giveaway runs through January 21st. Good luck! Thanks for spreading the word about this awesome giveaway, Jean!